Iowa is the only state that ranks in the top 10 in both higher education and Pre-K-12 according to new rankings from U.S. News & World Report. Iowa’s education system has long been a source of pride in the state. Businesses in Iowa benefit from quality, research-driven universities responsive to the needs of employers and a grade school system making strides in science, technology, engineering and math (STEM) education. Iowa’s three public universities (Iowa State University, University of Iowa and University of Northern Iowa) and 15 community colleges are pillars supporting the state’s workforce strategy. In fact, Iowa Governor Kim Reynolds and a coalition of business and education leaders have set a goal under the Future Ready Iowa initiative for 70 percent of Iowa’s workforce to have education or training beyond high school by 2025. Here’s a positive sign for reaching that goal: students entering Iowa’s three, four-year universities are achieving degrees at a rate far higher than students studying in neighboring states, according to the U.S. News & World Report rankings. 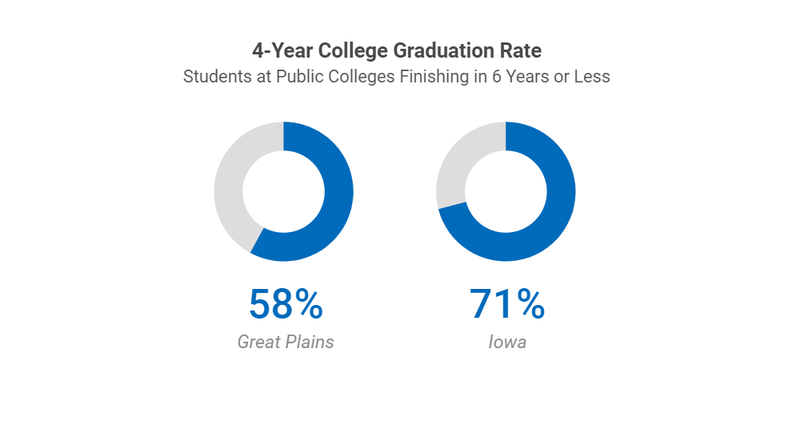 Seven-in-10 students pursuing a four-year degree at a public university in Iowa have a diploma in-hand within six years. That’s the third highest percentage in the country and a number which far surpasses our neighboring states. Iowa’s public universities excel in attracting research and development projects. The Association of American Universities (AAU) is a coalition of the top 62 private and public research universities in the U.S. and Canada. These are the universities which attract the most research dollars, and are home to some of the world’s most respected faculty. Iowa is one of just seven states to have two public universities which are AAU members. This research edge drives Iowa’s biosciences industry, and it makes it one of the fastest growing sectors of the state’s economy. For several years, Iowa has been at or near the top in the percentage of its students who graduate from high school. However, graduation is just one piece of what Iowa’s grade schools are doing well. A large percentage of Iowa’s high school students are earning college credit hours before they earn their high school degrees. Three-in-10 Iowa high school students earn college credit while still enrolled in high school, which is the highest percentage in the nation. Iowa’s educational leaders are also seeing results from programs to increase student interest in science, technology, engineering and math (STEM) careers. The number of Iowa high school students taking Advanced Placement (AP) tests in STEM subjects increased 32 percent from 2012 to 2016. This early interest in STEM is beginning to show its effects at Iowa’s public universities, where the number of STEM degrees received increased 18 percent from 2011 to 2015. It’s worth repeating – Iowa is the only state U.S. News & World Report ranked in the top 10 for both higher education and Pre-K-12 education. That’s important for any business looking for educated employees. Beyond the rankings, Iowa is a state committed to meeting the future needs of business. With good schools, ambitious workforce education goals and impressive research universities, businesses that set down roots in Iowa will find quality employees and easy access to innovation. For more information on doing business in Iowa, reach out to the Iowa Economic Development Authority at opportunities@iowaeda.com.